David F. Routon was born in 1931 in Jackson, Tennessee, living there through his teen years. Like many who choose visual art as a profession, his interest in visual imagery emerged early. Off and on throughout his childhood and early teens, he drew and painted. As a young adult, he briefly experimented with other career options: he entertained a secondary interest in prose writing by working in journalism and explored documentary film-making as a possible outlet for his visual interests. But ultimately his vocational focus reverted to drawing and painting. He attended various colleges, eventually earning his B.F.A. degree in 1959 from Mexico City College, a private English-language institution in Mexico, followed in 1963 with his M.F.A. from the University of Iowa. Thereafter, his profession focused on university-level teaching at Michigan State University, The State University of New York at Plattsburgh; the University of Minnesota, Minneapolis; and, finally, 21 years at the University of Nebraska-Lincoln from which he retired in 1997. He presently resides in Lincoln. Over the years, Routon has produced a body of pictorial artwork which he has exhibited regularly in various venues including juried exhibitions and invitational and one-person shows. For a time, he created images for publication, most for the University of Nebraska Press, including book cover drawings and paintings as well as inside illustrations. Routon has also created portrait commissions, both oil paintings and drawings, including one of the late U.S. senator from Nebraska, Carl T. Curtis, which currently hangs in the U.S. National Park Service building, named after the senator, in Omaha. His work is included in the following museum, university, and corporate collections: St. John’s University, Collegeville, Minnesota; The 3M Company, St. Paul, Minnesota; Sheldon Memorial Art Gallery, Lincoln, Nebraska; Frederick R. Weisman Art Museum at the University of Minnesota, Minneapolis; Sioux City Art Center, Iowa; College of Notre Dame of Maryland, Baltimore; Doane College, Crete, Nebraska; and Museum of Nebraska Art, Kearney, Nebraska. “I draw and paint representationally, using as my subject, for the most part, the human figure, usually clothed, and mainly the head. I have worked from both direct observation and photographs. Most of my work has been in the exploration of personal imagery, but a secondary involvement has been the more conventional imagery of popular portraiture. I enjoy rendering the straightforward realism of conventional portraiture, because I admire some of the work in the tradition of that genre. In my personal imagery, I seem to favor three subject matter sources: old photographs, the footage of motion pictures and imagery by other artists. As examples, I have made drawings and paintings derived from imagery in the 1940s spy film by Fritz Lang, The Ministry of Fear; photographs of the 19th century American New England poet, Emily Dickinson, and her associates; and passages in the paintings of Gilbert Stuart, the American artist best known for his portraits of 18th century dignitaries. In these non-commissioned efforts, I manipulate imagery with devices used by some of the American so-called ‘Pop Art’ painters whose works are oriented toward the figure. Such imagery varies emphasis among the different parts of the imagery of a painting or drawing. For Sodhouse Family, Routon researched the work of pioneer photographer Solomon D. Butcher, renowned for his thousands of images of homesteading families in Nebraska who were settling the prairie over 100 years ago. 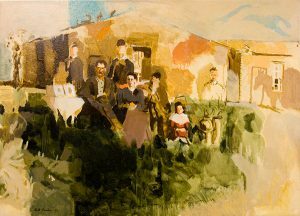 The Museum of Nebraska Art holds one painting by David Routon.